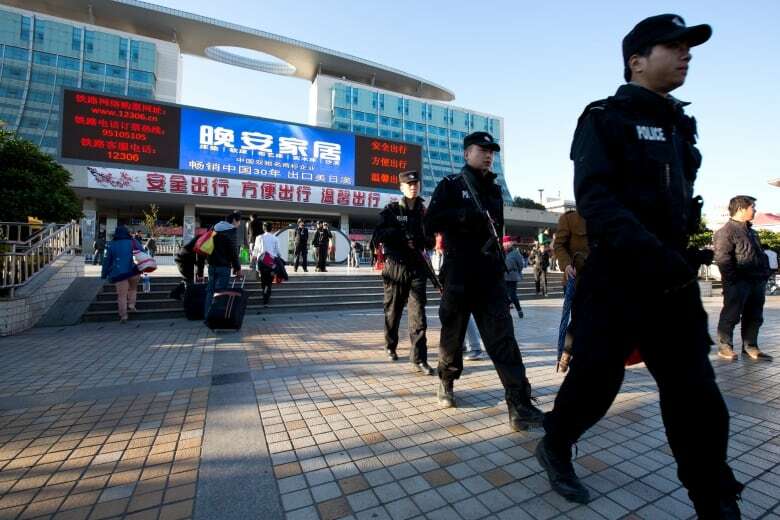 Authorities on Sunday blamed a slashing rampage that killed 29 people and wounded 143 at a train station in southern China on separatists from the country's far west, while local residents said government crackdowns had taken their toll on the alleged culprits. Police fatally shot four of the assailants — putting the overall death toll at 33 — and captured another after the attack late Saturday in Kunming, the capital of Yunnan province, the official Xinhua News Agency said. But authorities were searching for at least five more of the black-clad attackers. State broadcaster CCTV said two of the assailants were women, including one of the slain and the one detained. "All-out efforts should be made to treat the injured people, severely punish terrorists according to the law, and prevent the occurrence of similar cases," said China's top police official, Politburo member Meng Jianzhu, who arrived in Kunming early Sunday, an indication of how seriously authorities viewed the attack. The attackers' identities have not been confirmed, but evidence at the scene showed that it was "a terrorist attack carried out by Xinjiang separatist forces," Xinhua said. The far western region of Xinjiang is home to a simmering rebellion against Chinese rule by some members of the Muslim Uighur population, and the government has responded there with heavy-handed security. Police in Kunming on Sunday were rounding up members of the city's small Uighur community, believed to number no more than several dozen, for questioning in the attack and information about the assailants. "How do we know them?" said a Uighur man who gave only his first name, Akpar. "We could not tell if the assailants were Uighurs as they were all dressed in black. We did not like the attack either." Most attacks blamed on Uighur separatists take place in Xinjiang, where clashes between Uighurs and police or members of China's ethnic Han majority are frequent, but Saturday's assault happened more than 1,500 kilometers (more than 900 miles) to the southeast in Yunnan, which has not had a history of such unrest. Kunming residents expressed dismay at both the attack and the conditions within China that could have allowed it to happen. Restaurant worker Xie Yulong said the attackers were "worse than animals." But he also expressed sympathy toward ethnic Uighurs, saying their region has come under severe security crackdowns in recent months under the government of President Xi Jinping. "It's the pressure," Xie said. "Beijing has put too much pressure on them since Xi Jinping took over. They are under so much pressure they do not want to live, and they did that." Another Kunming resident, Jiang Hua, said the attack has made people scared to go out at night. "I think we should chase off the Uighurs and let them be independent," Jiang said. "And local authorities should be held accountable for providing public safety." Witnesses described assailants dressed in black storming the train station late Saturday evening and slashing people indiscriminately with large knives and machetes. Student Qiao Yunao, 16, was waiting to catch a train at the station when people started crying out and running, and then saw a man cut another man's neck, drawing blood. "I was freaking out, and ran to a fast food store, and many people were running in there to take refuge," she told The Associated Press via Sina Weibo, a Chinese microblog. "I saw two attackers, both men, one with a watermelon knife and the other with a fruit knife. They were running and chopping whoever they could." Alarms over a possible spread of militant attacks to soft targets beyond the borders of Xinjiang were first raised in October when a suicide car attack blamed on three ethnic Uighurs killed five people, including the attackers, at Beijing's Tiananmen Gate. Sean Roberts, a cultural anthropologist at George Washington University who has studied Uighurs and China for two decades, said the Kunming violence would be a new kind of attack for ethnic Uighurs — premeditated, well-organized and outside Xinjiang — but still rudimentary in weaponry. "If it is true that it was carried out by Uighurs, it's much different than anything we've seen to date," Roberts said by phone. But he added that it is still unclear whether there is any organized Uighur militant group, and that attacks so far do not appear linked to any "global terrorist network, because we're not seeing things like sophisticated explosives or essentially sophisticated tactics." The U.N. Security Council on Sunday issued a press statement that "condemned in the strongest terms the terrorist attack" on the train station. The statement reiterated that "any acts of terrorism are criminal and unjustifiable regardless of their motivation" and underlined the need to bring those responsible for the attack to justice. The violence in Kunming came at a sensitive time, with political leaders in Beijing preparing for Wednesday's opening of the annual legislature, where Xi's government will deliver its first one-year work report. Willy Lam, a political observer at the Chinese University of Hong Kong, said the attack coming so close to the National People's Congress dented Xi's message of a "Chinese Dream" coalescing under his rule. "Pockets of dissatisfaction, groups of people with grievances, appear to be increasing. After 1 1/2 years of more heavy-handed control (in Xinjiang), the report card does not look good," Lam said. Xi called for "all-out efforts" to bring the culprits to justice. The Security Management Bureau, which is under the Ministry of Public Security, said in a statement that police would "crack down on the crimes in accordance with the law without any tolerance." The attack was the deadliest violence attributed to Uighur-Han conflicts since riots in the Xinjiang capital of Urumqi in 2009, in which Uighurs stormed the streets of the city, targeting Han people in seemingly random violence that included the killing of women and children. A few days later, Han vigilante mobs armed with sticks and bats attacked Uighurs in the same city. Nearly 200 people died.